It seems as though all hell is breaking loose, that every corner of the globe is filled with violence, disaster, and every kind of spiritual sickness. Our relationship with God seems permanently broken, as so many souls reject, revile, or worse, are indifferent to their own Creator. Humanity is surrounded by a maelstrom of evil from which there seems to be no escape–at least that is what the devil wants us to believe and to despair of hope. But we are not alone. God has given us powerful defenders. Mankind is in the midst of a battle, which has been fought since the beginning of Creation; between Christ’s Angels and the fallen angels or demons. When God created the angels, they were tested before they could see Him face to face. It is believed that it was revealed to them that God would become man and not an angel. Lucifer, being a proud spirit, responded “Non Serviam” — I will not serve! St. Michael answered with the battlecry “Who is like God?” St. Michael and the Holy Angels have been given the authority from God by the power of His Holy Name to protect and defend God’s people against both human and diabolical enemies. 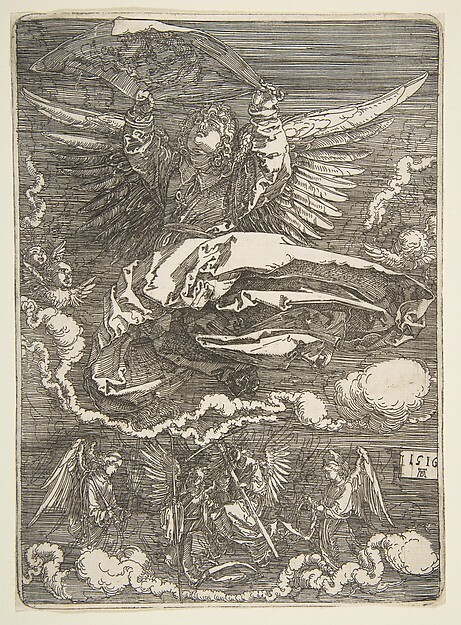 St. Michael is named as the primary patron of devotion to the Holy Face. 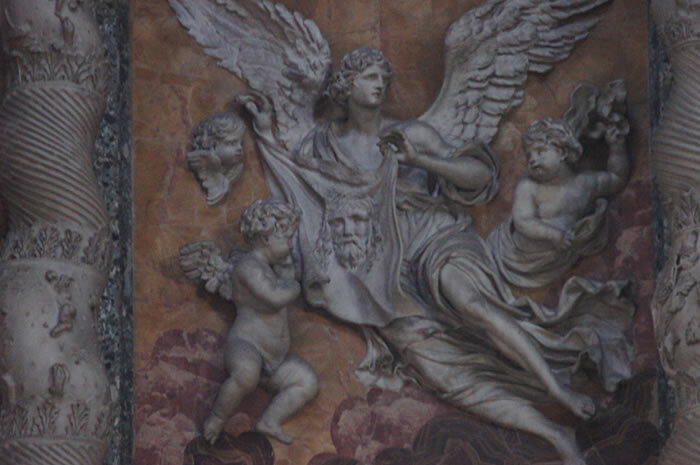 This is reflected in many ancient works of art in churches where St. Michael or the Holy Angels are portrayed holding the Veil of the Face of Christ. A fascinating article was written recently by Gelsimo Del Guercio (here) about seven sanctuaries, dedicated to St. Michael, which are linked by a straight line called the “Sword of St. Michael.” The imaginary line “represents the blow with which St. Michael sent the devil to hell.” I would like to add an eighth Sanctuary to the list: The church of the Sanctuary Basilica of the Holy Face of Manoppello. In God’s mysterious design this sanctuary, which contains a miraculous veil of the Face of Jesus, was named for St. Michael though no one who is alive today remembers why. 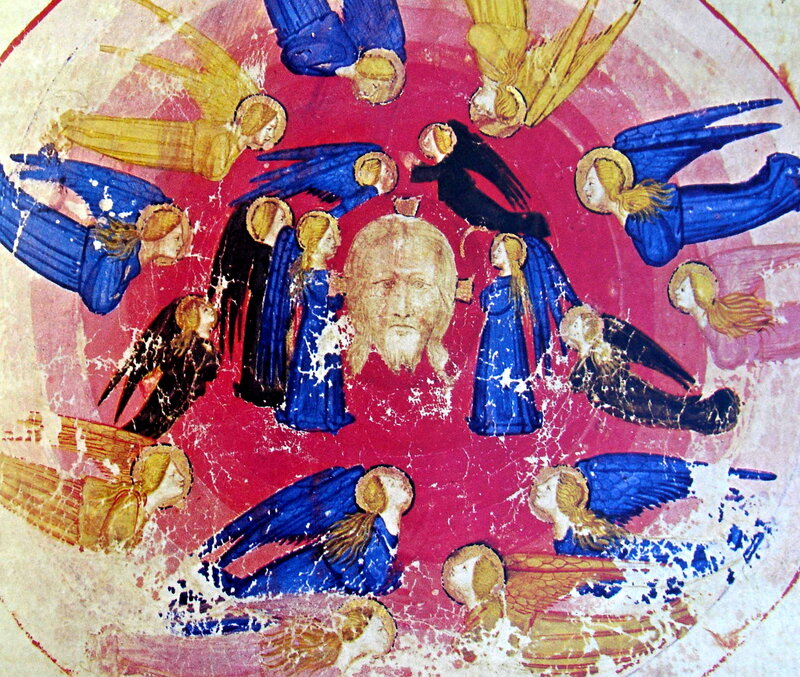 The sanctuary, in Manoppello, Italy, falls at the center, on a map, of the legendary “Sword of St. Michael.” St. Michael and the Holy Angels come to our aid and they are bearing His Holy Face! 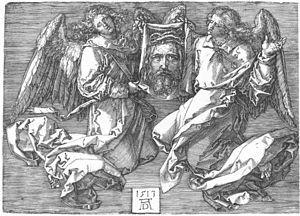 I didn’t know about the link between St. Michael and the Holy Face devotion. Very interesting. 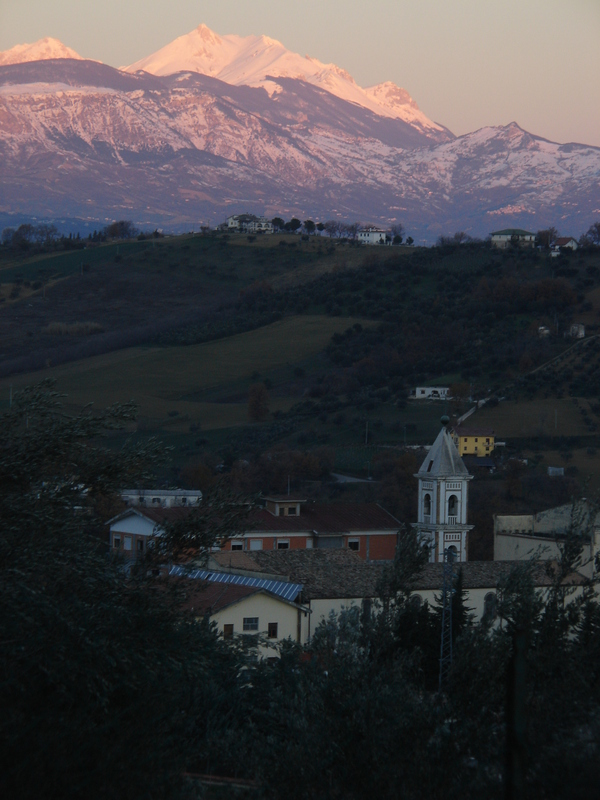 And how amazing that Manoppello is at the centre of that line of shrines. Thanks for sharing this, Patricia. I visited not too long ago. 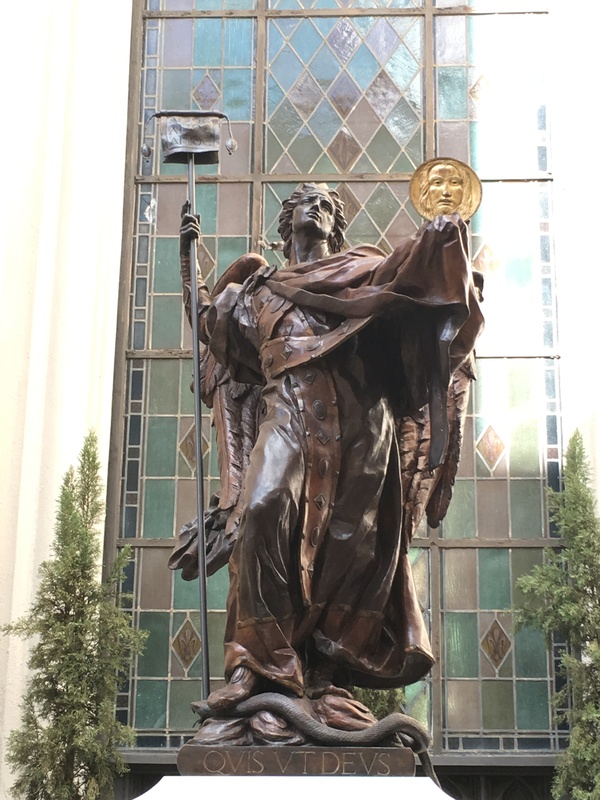 At the time I didn’t know the church was dedicated to St Michael – all I saw were signs for the Sanctuary of the Holy Face, and I have no Italian. Only later a priest in the know told me. It was wonderful to be there as a pilgrim. 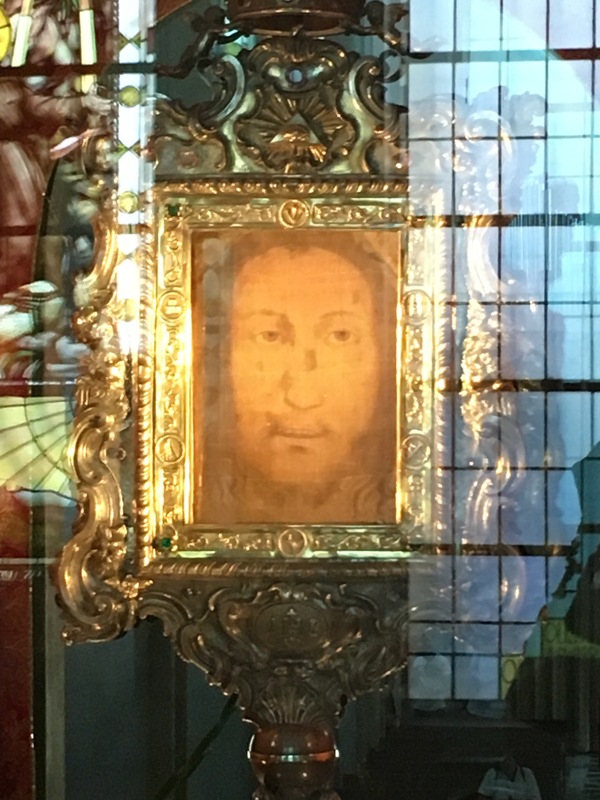 So simple and quiet, and I wish I’d had more than a day there to spend looking at the Holy Face. I also happened to visit the Sacra di San Michele specifically to honour my patron. He’s got his eye out. We need his intercession more than ever!